A wide range of possibilities – off the beaten track. Open up your mind and immerse into the mystical world of mountains. Marvel at the awesome landscape and enjoy the silence of nature. 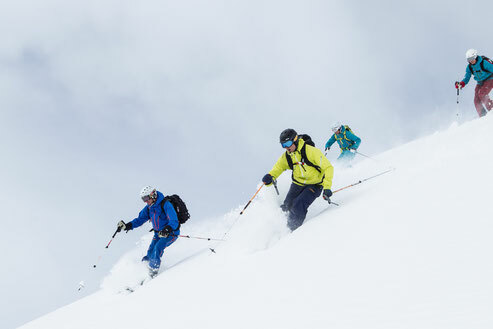 If it is off-piste or on a ski tour – we plan a suitable tour for every demand and almost every level of physical ability. Above the forest line we apply other rules. Safety ranks first. Our guides will select the most beautiful trips for you, according to circumstances. With all trips you’ll have a short introduction into prevention of avalanches and the use of the avalanche security material. The participants are guided by professional guides. Max. group size: 6 person per guide. Required fitness level: the participants should be able to walk for 2-3 hours uphill. The above mentioned equipment can be rented at inandout or at the local sports stores. We are happy to help.